Capcom has been busy lately re-releasing all of the classic Resident Evil games on current gen systems. Right now we have the HD re-releases of Resident Evil 0, Resident Evil Remake, Resident Evil 4,5 and 6, and now Code Veronica will be available on the PS4... as a PS2 Classic. Capcom announced on their Twitter account that the game will be available this week. Resident Evil: Code Veronica is kind of the red headed step child of the Resident Evil series. It was released right before the series made the major transformation with Resident Evil 4 and while the game is still a great game, it is a little dated at this point. 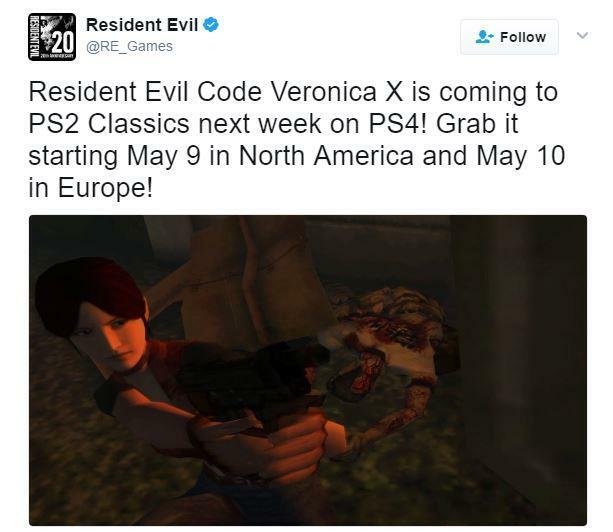 Resident Evil Code Veronica X will be available via PS2 classics on May 9th in the US and May 10th in Europe.